The Virginia Ten miler was not on my radar of events to consider running this year...or ever really. The more I think about it...I had heard of this particular event before, currently in its 39th running, but I can't say I had thought "that's a must do race for me." However, having had the opportunity to run it last weekend (now finally publishing over a month ago), I must confess it made a big impression on me and it will certainly be on my calendar for years to come. 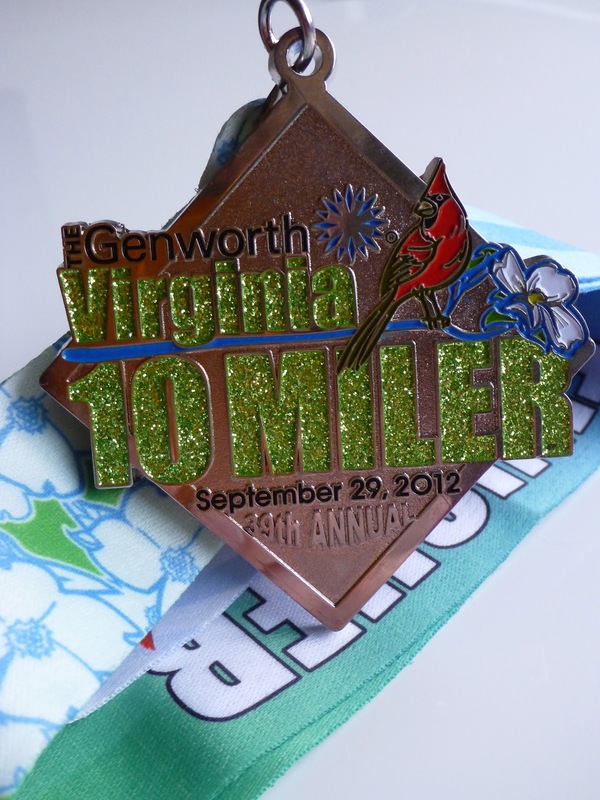 The details surrounding the run were pretty unique, as I actually WON an entry into this years Genworth Virginia Ten Miler, but not won as in qualified or placed fast enough to be invited, instead WON as in FREE, like out of a hat free, thanks to Blue Ridge Outdoors Magazine! I had entered one of their giveaway contests for which my mentality is usually "I'll enter this because to have a chance to win, you have to enter" but usually don't think much about it as I've probably entered a couple dozen contests on their site without having ever heard anything (As a side note to Blue Ridge Outdoors, you guys should totally request contest winners to submit a blog entry or recap of the events). As I left class Friday morning, a week prior to the race, I received a call from Blue Ridge Outdoors letting me know that I had been selected for a FREE (Yes, caps lock is necessary) entry to this years Genworth Virginia Ten Miler! I omitted the fact that I had been suffering from cold-like symptoms for the past 3 weeks and had just one week ago to the very hour been told I had bronchitis, but I thought "Hey, its FREE. Why not?" and just like that I began mentally preparing myself for the run in just over a week. Through the fall my training had been perfect as I prepared for the Marine Corps Marathon in late October, but a cold had significantly derailed my training, so much so that my longest run through today is just over 16 miles...that's another blog post though. My first run in three weeks came just 6 days before the Virginia Ten Miler, I decided to ease back into it and that 4 miles was an acceptable start. I felt comfortable through the first mile and a half or so, then began to feel as if my breathing was constricted and noticed I seemed to be working harder to maintain a "usual" pace. I again managed runs on Tuesday and Wednesday leading up to Saturdays race of 4 and 9 miles respectively. Not having anything invested in the run it was easy to be relaxed and take it all in stride, as Fridays dinner wasn't your typical pasta dinner instead break-and-bake cookies were the fuel of choice. I turned in for the evening around 11:30 and set my alarm for 3:45AM the next morning. After stumbling around to find my phone to turn off my alarm, I shoveled in a bowl of Cheerios and a banana before jumping in the car for a what may be my earliest start for a race day...ever. The first hour of the drive was relatively easy with the majority being on I-81 from Blacksburg up to exit 175 where I found the twistiest-foggiest road possible at 5 in the morning, I arrived at E.C. Glass High school just after 6AM and headed in to find my race bib and t-shirt. Unfortunately, they had run out and shirts were only guaranteed for runners who registered early....a bummer as the shirts were nice technical -t's, but again I only had gas invested in the drive to the run so I was just happy to be there participating. I did however receive the nicest Brooks drawstring race bag I've seen which partially made up for not receiving a shirt. I had a TON of time to sit around and wait, I found the heated seats in the Subaru particularly useful in helping the time pass. My fear was falling asleep and missing the start so I eventually decided to pry myself from the cozy car and take in the overwhelming pungency of embrocation. Around 7:50 all the runners began lining up for the 8AM start, they announced some of the elite athletes including 3 previous Virginia Ten Miler winners and a 2012 US Olympic trials athlete. The coolest part however, was the honorary number 1 worn by a gentleman who had run all 38 previous Virginia Ten Milers, a true champion in my opinion. I lined up in the 8:00-9:00 minute pace area and quickly realized that I was going to be passing A LOT of people in front of me. The race also included a 4 mile run which started simultaneously so I think a lot of these folks were lining up based on the shorter distance. When the horn sounded we all took off and to my surprise I felt fresh and light, I was very pleased considering I had missed three important weeks of training but knew it was way too early to tell where my fitness was. The first few miles flew by and as I glanced down at my watch I knew I was running well based on the mid-7 minute miles I was doing. I decided to go for it and see what I had in the tank, when the race split at the four mile mark I began looking ahead picking off runners one-by-one. Just after mile 5 I put myself a bit into the red on an uphill in a park. I decided to ease off and allow myself to recover going from a 7:06 5th mile to a 7:26 6th mile. I was forewarned the Saturday before the race by Michelle's dad that Lynchburg was a hilly town and to be prepared for nothing but up and down. I had been to Lynchburg numerous times in the past but always in a car where its easy to ignore the grade of the road. The great thing about the course was that it was an out and back, so you knew what you had to do on the way home and could conserve appropriately, this was also the downfall of the race. Every time I went down a hill I thought there's another one for the way home, but the time away from running over the previous three weeks allowed me to attack each successive hill harder and continue to pick off runners. As I approached mile eight I knew from the course description on the website that there was one long sustained hill between me and the finish, "the infamous Farm Basket Hill." I have to admit, I did fade on this hill dropping from a 7:07 eighth mile to 7:28 and 7:49 ninth and tenth miles respectively. 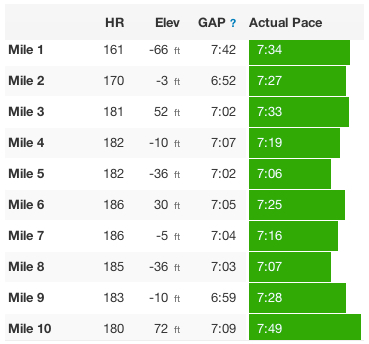 However, when considering the grade of the hill, Strava computes the Grade Adjusted Pace (GAP) which for the 8, 9, and 10 miles were 7:03, 6:59, and 7:09; so I was still turning over quick miles and consistent GAP for the entire race. Crossing the finish line I was pleased with how I ran the race and the outcome of a new PR, 1:14:54. As I've mentioned before, I often establish these "arbitrary" goals for myself one of which was running a sub 1:15 and the other was finishing in the top 10% of the race. I established the 1:15 time from last years results where the top 10% (110/1102) was bounded by a time of 1:14:31 (110th place), but the 112 runner ran a 1:15. The field this year was more competitive, where the top 10% (129/1299) was bounded by a time of 1:13:16, over a minute faster than 2011. At the end of the day I finished 160/1299 or 12.3%, not bad but not where I wanted to be either. The finish line festivities included pizza, bagels, and a variety of other snacks. I ventured over to the Blue Ridge Outdoors booth to thank them for the FREE entry and let them know I had an absolute blast! Eventually I hopped in my car, turned on the heated seats and drove home to watch my Hokies lose. As I mentioned above I will consider putting this race on my calendar next year as it's convenient to Blacksburg and a very well run event. I'd recommend it to anyone interested in a challenging course and to runners who prefer hills over the flats, like me. Posted by Unknown at 1:32 PM , Links to this post , 0 comments I'm reading from MyDailyGround: The Virginia (Lynchburg) Ten Miler Race Report Tweet this! WOW! It was an action packed weekend here in Charlotte, full of water (x3) and lots of eating! The weather was phenomenal and set the tone for a perfect weekend. I have to confess, I've been uncharacteristically sedentary since The North Face Ultra Endurance Challenge two weeks ago. And it has been fantastic. My diet has been horrendous which usually isn't an issue when I'm logging 30+ miles a week running. I feel I made up for some of it this weekend. Michelle and I made the most of the every minute this weekend, beginning early Saturday morning. I had scheduled us a stand up paddleboarding (SUP) lesson for 10AM and decided we needed a good breakfast...really I just love eating and banana pancakes sounded amazing! I've been trying to be better about using all of the produce I buy. One way I have been able to accomplish this is by throwing fruit that is overripe into the blender and making smoothies. I almost always have bananas in the house, but sometimes its difficult to use them all before they go too ripe for my liking (I prefer them on the green side...not yellow with spots). I stumbled across a recipe via Pintrest that used overripe bananas for pancakes. Better yet, they're whole wheat. Once we were all fueled up, we packed up the Subaru and headed north toward Latta Plantation which is on Mountain Island Lake about 15 miles north of the city. 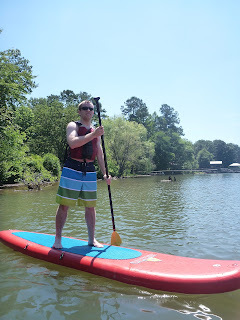 When I purchased the Groupon the details included a two-person evening/sunset paddleboarding lesson, but when scheduling the lesson I decided the earlier slot worked out best as we had plans to head to the U.S. National Whitewater Center for the Brew Stash Bash. More on that later. We were the first to arrive at the put in location, which also happened to be where we took our kayaks Sunday morning. 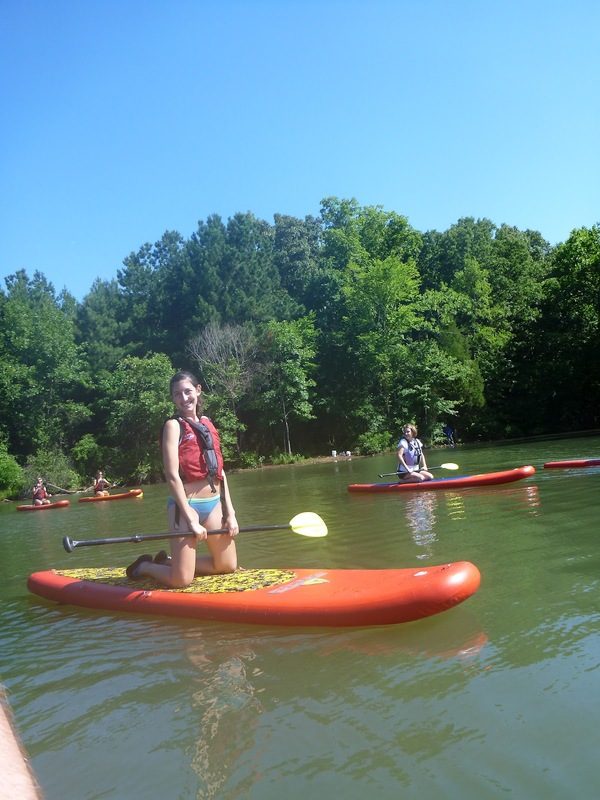 I introduced myself to the instructor who was unloading the paddleboards from his truck. 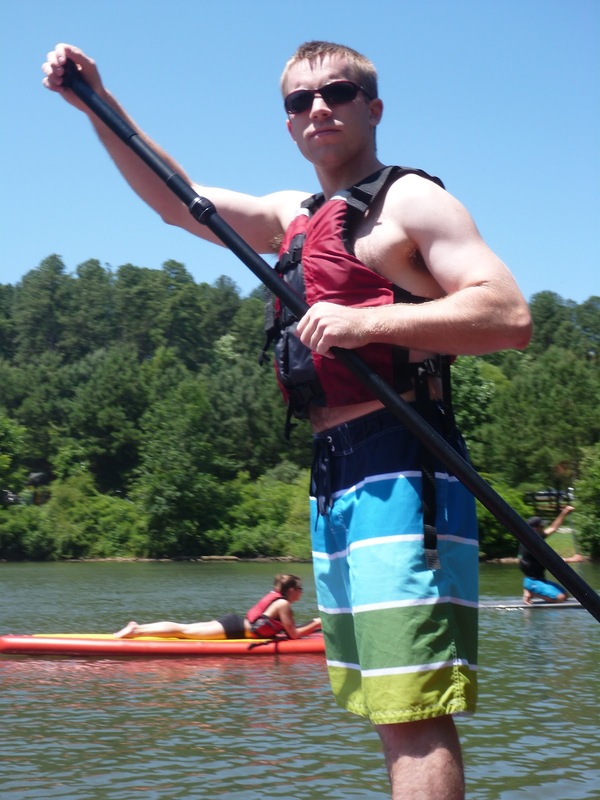 As soon as he mentioned his name, Luke Hopkins, I realized our instructor was also the owner of the paddleboard company, Stride. The company had caught my attention a few months back when I read an article in Blue Ridge Outdoors about best rivers, which quoted Luke about the New River as a favorite SUP run. What really caught my eye was the fact that the company is based out of Blacksburg, VA. Awesome! Buy Local. Eat Local. Be Local. The group was 8 in total, including the instructor which seemed to be the perfect ratio. After a brief on land lesson we were out on the water paddling but not standing up, instead paddling from a kneeling position. Eventually after a brief instruction on standing up the group bravely attempted standing, surprisingly with great success. To say that we had a blast would be the understatement of the century. I probably spent about as much time in water as I did on my board, not because of difficulty but because I was trying to challenge myself by walking forward and backward on the board. This also proved an excellent opportunity to try out my new point and shoot camera. My old point and shoot survived 6 years, including a trip out west to Philmont in Cimarron, New Mexico and a summer in the back pocket of a sweaty cycling jersey cycling cross country. This purchase has been long planned for and while I waited (just over two years) they released two newer versions. I took a bunch of photos during the two hour course seen below. Two notes about the photos. I have not purchased a floating strap for the camera yet (all the reviews on Amazon say the smaller sections of straps break where attaching to the camera) so it was attached to my life jacket via carabiner. This made aiming/framing the photos more difficult. Second neat note is that the camera has a GPS feature and geotags each photo when taken (if the option is selected). This is useful and just really a cool bonus feature when viewing photos in iPhoto by place/location. Everyone's first time standing up! Michelle dominated the balance aspect from the start. After paddling around for awhile Luke suggested we play a little game by creating a really long train also known as the worlds longest paddleboard. 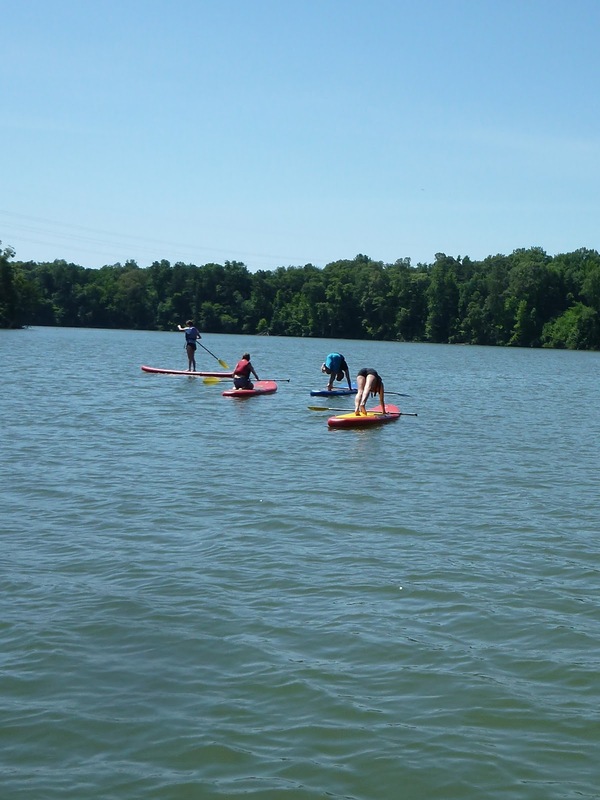 Each individual pulled the person behind them onto the stern end of their board. We paddled around for a while together which ended up as us paddling around in a giant circle. The fun thing about this was that everyones weight and movements were magnified through the train, so if one of us got wet, it was likely we all were! Michelle being pulled up to form the "World's longest paddleboard"
At this point we began making very large circles. The tricky part came when you had to detach yourself from the train, which was accomplished by moving to the back of the board lifting the front of your board off the train. I fell. Michelle didn't. Story of the day! A really cool feature of the Stride SUP are rings on the edges of the boards, which can be used to add dry bags to the front or rear for longer outings (or optional kayak seat)...or to latch together two boards with carabiners, creating an awesome two person board! I resisted the huge temptation to push Michelle off her board which was good because I needed her in my favor for the upcoming two person race. We didn't win...and almost ate it several times but managed to not fall in. Michelle and my boards joined together via d-rings and carabiners. Luke took some photos of us, pretty awesome start to our Saturday. 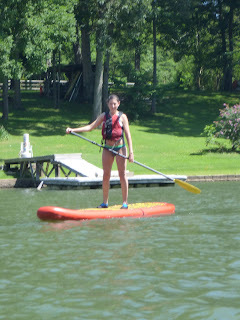 For the second hour of the lesson we were able to simply paddle around and try to hone our skills on the paddleboard. Michelle seemed to master moving to the back of the board and making a sharp tight turn...I managed to master the fall into the water looking silly. I did have a blast the whole time while doing it though, it was tough not to have a smile on your face. 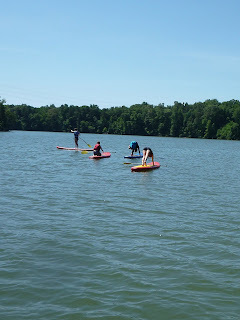 The class giving yoga a try on the paddleboards. hard at work...or hardly working? Eventually I agreed to entrust Michelle with the camera...it is waterproof after all...it just doesn't float...yet. 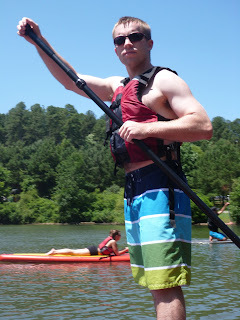 A little after noon we paddled back to shore and thanked Luke for the awesome lesson. If your in the Charlotte, NC area (or near Blackburg or Roanoke,VA) I would HIGHLY recommend looking into a lesson with Stride. The experience could not have been any better! There is just something about being outside in the sun and out on the water that makes me think of grilling out. More specifically, hot dogs. That's exactly what I was craving as we were making the short 15 mile drive back from Mountain Island Lake. Michelle and I agreed that we would try to eat out less in an effort to eat healthier, but on a Saturday like this we couldn't help but stop to try Green's Lunch. Green's has been around in Charlotte since 1926 and somehow Michelle and I had not managed to try it (well the real reason is their hours are M-F 7AM-4PM Sat 9-2, a little tough for someone who doesn't work in the city). Additionally, I didn't even know they accepted cards until I just looked up their website (Yelp claims cash only). The place was pretty full when we arrived around 1, and after asking the lady what to order, Yelp say's they're the best hot dog place in town, hence why I thought of Green's to go for lunch. We decided on a cheeseburger all-the-way (slaw, chili, mustard, onions, maybe some other stuff?) 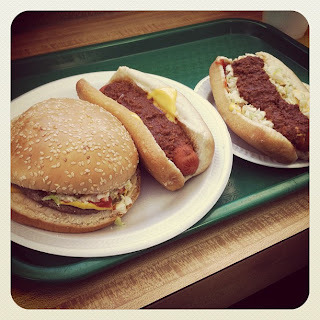 a chili cheese dog, and a hot dog all the way. $7. Can you beat that? I will definitely be stopping in again! Green's Lunch. If you haven't tried it, you haven't lived! For the second half of Saturday, on our 3x Water weekend, we headed out the U.S. National Whitewater Center (USNWC) for the Brew Stash Bash. 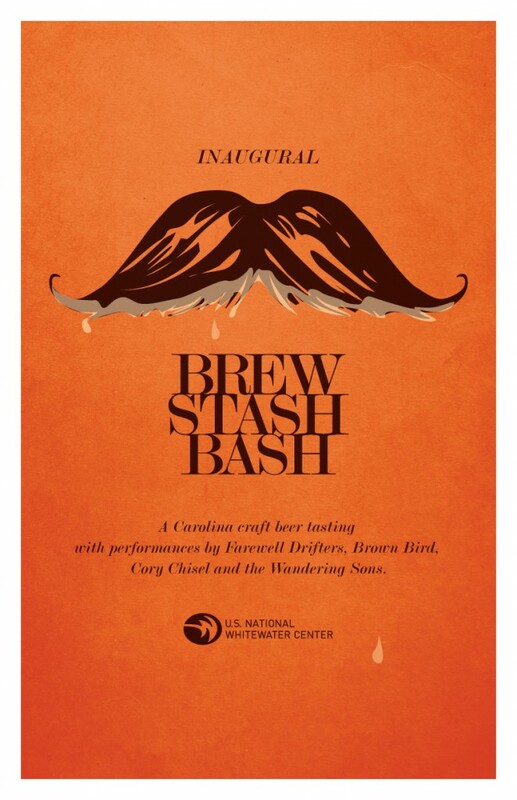 The inaugural Brew Stash Bash was marketed as a "Carolina craft beer tasting" included beer samplings from 10+ North Carolina breweries and live music, free to the public ($5 parking fee). The USNWC is just a cool venue with the "river" flowing right behind the stage and plenty of large boulders for seating, it's perfect for concerts and provides a chill-relaxed-atmosphere. When we arrived, parking was at a premium as folks arriving were being directed into employee parking only to find out the lot was already full. Luckily the Outback handled the off-road conditions, Subaru Love! 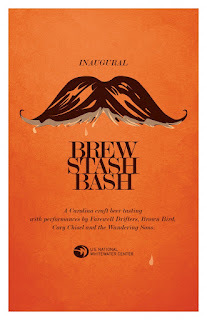 The USNWC really is a great location for families, as it has not only whitewater rafting but also a climbing wall, zip-line, high ropes course...plus the Brew Stash Bash for all those overworked parents. Again, I brought my new camera to take photos and document the afternoon. The picture above shows the zip-lines from a tower behind the stage. The Whitewater Center is pet friendly, four legged friends were abundant at the Brew Stash Bash and when we've been there on Thursday evenings for the Whiteater River Jam concert series (also free, $5 parking). The dog enjoying the water...it was pretty warm Saturday afternoon. Finally we called it an evening and headed back toward town with a scenic detour on the way home, as I was not paying attention and missed the exit for I-77. All that time at the Whitewater Center made us work up an appetite and I couldn't think of a better treat then froyo. Froyo (frozen yogurt) is like the cupcake of 2011. Little boutique stores are opening all over the place, but with so many the prices are great and the serve yourself makes sure you don't get "Coldstoned." Sunday morning we decided to continue our water themed weekend and do a three-peat...errr...triple-threat-water-weekend....3x Water! This was only the second opportunity we've had to take out our kayaks as Michelle has been out of town for the past couple weeks. After our great experience at Mountain Island Lake Saturday morning, we decided to return and explorer further out into the lake, plus it was only 15 miles to the put in which worked well for our schedule. Just as we were leaving the no wake area we saw a bunch of Canadian Geese. Normally I'm not a fan as they make a mess of our walkways at work, but out here in their element swimming, plus there were like 30 of them...and they can be vicious! 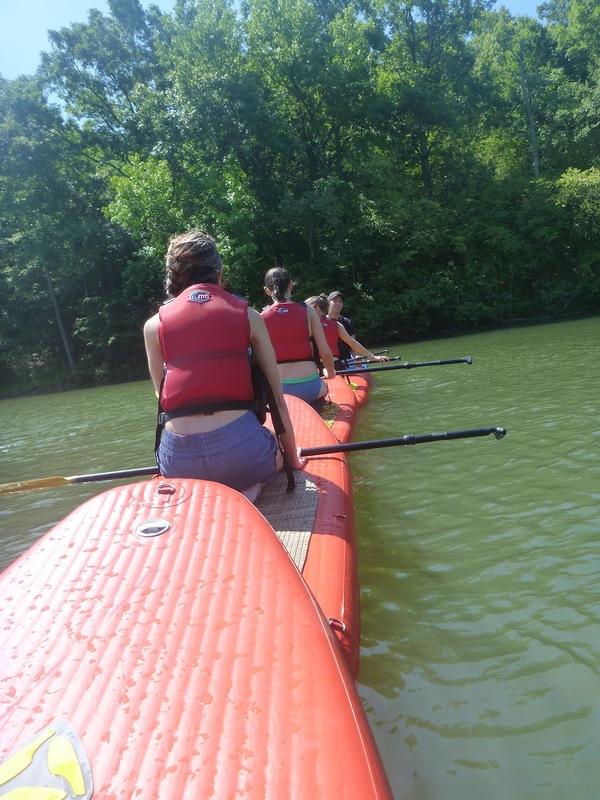 Our experience on Saturday paddleboarding made me envy the ease of getting in and out of sit-on-top kayaks and the ability to go play in the water when you get hot. We managed though, we found a nice shore to go swimming at and cool off! I'm really looking forward to taking our kayaks out to a river, not anything serious, just something with a current instead of being entirely responsible for my movement. With Michelle headed home in the early afternoon for fathers day, I found myself tempted to go out for a mountain bike ride. It is sad to admit that I had to literally dust off my mountain bike, as I haven't taken it out since last fall (August??). The whitewater center is an awesome resource, but I didn't leave the house for my ride until 5 and I didn't feel like driving the 20 minutes over there +paying. Instead I opted for Renaissance Park, a county park with 145 acres including baseball fields, an 18-hole frisbee golf course, and a solid trail system for mountain biking. As it was late in the evening, I only saw one other mountainbiker out on the trails toward the end of my ride. All-in-all managed to get in over 7 miles which was good considering it had been 9 months since the bike had been out. It was an awesome weekend, absolutely jammed packed both days, amazingly enough it didn't really feel that exhausting, nor do I feel wiped today. I like to think all that recovery and binge eating over the past two weeks since my first ultra helped! Posted by Unknown at 3:23 PM , Links to this post , 1 comments I'm reading from MyDailyGround: Stride Stand Up Paddleboard (SUP) Lesson, Brew Stash Bash, & Kayaking Tweet this!